What we do know about the US Customs and Border Protection—the federal agency that oversees our country’s international trade, immigration services, and the increasingly militarized Border Patrol—is worrying. We know that CBP has a long history of racial profiling, excessive use of force, and mass surveillance. We know that the agency has a budget of nearly $13 billion and, if President Trump has his way, will soon be infused with 5,000 new agents charged with fulfilling his anti-immigrant agenda. But what we do not know about CBP is in many ways more frightening. We don’t know how many people the Border Patrol stops each year; how, why, and where Border Patrol operates its 100-plus interior checkpoints across the country; when agents engage in excessive use of force and what happens to them if they are caught doing so; or who, how, and with what technology the agency surveils in our country. As Donald Trump continues to make immigration and border security a central policy focus of his administration, the American public deserves to know how one of the largest law-enforcement agencies in the world operates. The standard methods of ensuring transparency have not worked with CBP: Its agents routinely employ tactics that would be unconstitutional if used by any other agency, and overall the agency is either brutally slow to process Freedom of Information Act (FOIA) requests or fails to respond to them at all. The processes are not working—there needs to be another way of holding the agency accountable. According to Todd Miller, author of Border Patrol Nation, whenever CBP faces scrutiny, the agency refuses to release information, relying on the catchall excuse of “national security.” And then, Miller described, “all the garage doors go down, everything is on lockdown.” In case after case, the CBP has failed to provide clarity on its practices in a timely manner, or even at all. In one example, after a Border Patrol agent shot across the border, killing a 16-year-old boy as he walked on a sidewalk in Mexico, it took over two years and a judge’s order just for the name of the agent to be made public. According to court filings, the Border Patrol “either lost or destroyed” the original videos of the incident. In another case—when CBP was found to warehouse recently detained border crossers in filthy, freezing, and humiliating conditions—the agency refused to hand over, and even destroyed, implicating evidence. 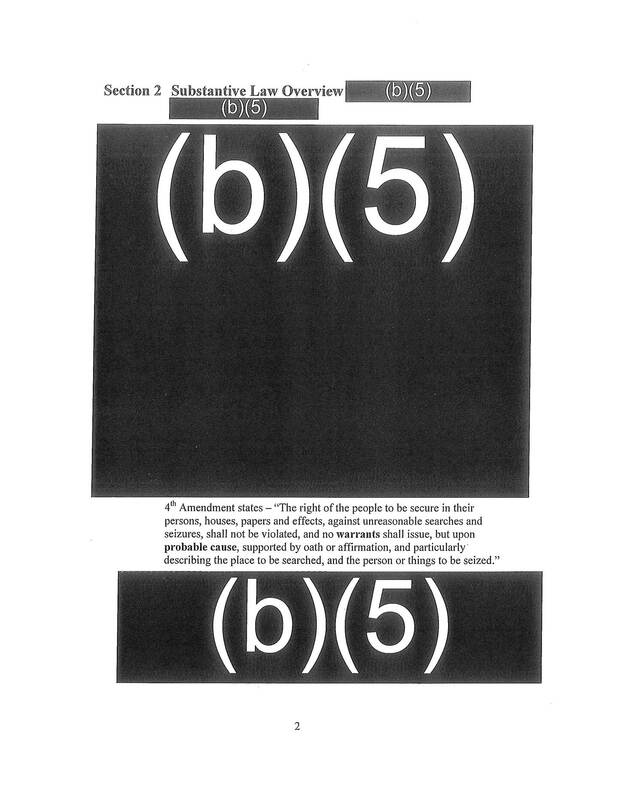 One page the CBP sent to the ACLU in response to a FOIA request was completely redacted except for the text of the 4th Amendment. The agency also routinely refuses to answer FOIA requests (a crucial resource the media has to pressure government agencies to make information available to the public), or redacts documents to the point of illegibility. Last year, the ACLU sent CBP a letter expressing its frustration with the lack of responsiveness to its FOIA requests, writing that “the public is routinely denied access to critical information about CBP activities. Extensive delays, inappropriate denials, and non-responses have resulted in costly and lengthy litigation.” In many cases, ACLU Policy Counsel Chris Rickerd explained, CBP simply doesn’t respond, and information is only obtained when litigation is pursued. He showed me a CBP response to a FOIA request in which entire pages are completely redacted. One page was entirely inked over except for the text of the Fourth Amendment. Los Angeles Times reporter Nigel Duara told me that he needs to throw “prolonged and sustained tantrum[s]” to get basic info from CBP, even for incidents in which agents have used lethal force. But the problems aren’t only limited to the airing of the truth; the truth itself is sufficiently damning. 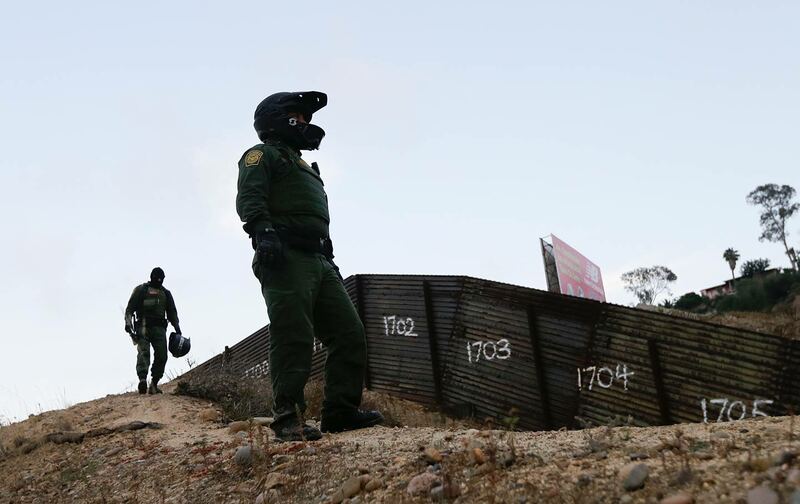 Agents have abducted and raped border crossers, molested them while in custody, destroyed life-saving water left for migrants, chased migrants off of cliffs, run them over in their vehicles, beaten to death a man in handcuffs, and colluded with Mexican drug-traffickers. They have routinely harassed borderlands residents, intimidated humanitarian aid workers, destroyed protected natural environments, treated asylum seekers like criminals, and denied migrants medical care. They have also psychologically abused migrants, set dogs on migrants, coerced migrants into signing voluntary departure, urinated on migrants’ belongings, separated migrant children from their parents, and detained migrants of all ages in freezing-cold holding cells for days without beds or proper sanitation. As the agency is poised to go through another growth spurt, even while potentially loosening the polygraph requirements for new hires, the American public deserves to know more about how CBP operates. As there seems to be no sign that ranking agency officials will begin engaging the public in a manner more befitting democratic principles, it falls on individual agents to step forward and speak out to those they are sworn to protect. Though blowing the whistle is a commitment to an uncertain future, and potential leakers and whistle-blowers should think hard about coming forward—whether publicly or anonymously—the United States has a long history of whistle-blower protection legislation, dating back to the Revolutionary War. As Alford explained to me, we probably won’t be getting informative leaks or data dumps from rookie agents at CBP. It’s typically workers in middle management, those who know how the system works and have years of experience and frustration with an agency or corporation—as well as the most to lose—who come forward. Due to continued reticence from CBP, however, any whistle-blower, at any level of the agency, would be shining a light into the darkness. We don’t think our asks are unrealistic…. Other large police departments report on who they stop and why, for instance. Border Patrol doesn’t. They don’t record if they stop someone unless they arrest them or there’s a complaint. So you don’t have enough data to make a judgment about whether they’re doing their job well, whether they’re engaged in unauthorized stops that may violate the constitution, or…whether what they’re doing is worthwhile. The ACLU explains that “although the government reports searching thousands of electronic devices a year at the border, the details of how it conducts these searches have been largely kept secret.” According to a recent article in Pacific Standard, “CBP says it can conduct these searches ‘with or without’ specific suspicion that the person who possesses the items is involved in a crime.” We do not know how many devices the agency searches every year, or what happens to the data its agents gather. Border Patrol’s actions don’t stop at the border, either. Federal rules give CBP free rein to operate in a 100-mile swath surrounding the country’s land and marine borders, enveloping all coastal cities and nearly two-thirds of the entire US population. Across this territory, the Border Patrol operates roughly 170 checkpoints, in which agents use their “extra-Constitutional powers” to search, detain, harass, and simply annoy residents. According to the Center for Investigative Reporting, four out of five drug busts, many occurring at checkpoints operated by Border Patrol, involve US citizens. At the same time, the 1976 Supreme Court case, United States v. Martinez-Fuerte, permits the Border Patrol to stop vehicles and question drivers or passengers in the absence of reasonable suspicion that the vehicle contains undocumented immigrants—even if the stops are made “on the basis of apparent Mexican ancestry” of the car’s occupants. Denvir writes that “CBP and Border Patrol officials seemed unsure about what legal requirements, like probable cause, governed agents searching cars for possible immigration and general criminal violations. One finally stated that probable cause was not necessary to conduct an immigration-related search.” That, however, may not be entirely true. For vehicle searches not at ports of entry, probable cause, consent, or a warrant are always necessary, Denvir explains. While the ACLU maintains that the Border Patrol cannot pull over vehicles to question their occupants without “reasonable suspicion” of an immigration violation or a crime, CBP’s own interpretation of the United States v. Martinez-Fuerte ruling is that the decision “balanced government interest in stopping illegal immigration against the Fourth Amendment’s protections…even in the absence of reasonable or individualized suspicion.” That’s to say, CBP reads the decision as creating Fourth Amendment loopholes when enforcing immigration laws. It’s very unclear how agents are instructed to use protected characteristics when they make day-to-day [law enforcement] decisions. Are they trained in implicit bias and its impact, and how stereotyping is not only an ineffective police practice but also damaging? Those are huge unanswered questions that are of great concern obviously to residents like ours in New Mexico who commute on a daily basis through Border Patrol checkpoints 80 miles into the interior and have to answer to an armed federal agent. This is really where the rubber meets the road, where fundamentally how this agency behaves is critical to border residents being able to live freely, safely, with dignity, go to school, go to church, go to the grocery store and not have to feel like they’re going to be singled out based on the color of their skin. Up to 20 percent of drone flights conducted by CBP are inside the United States, according to a GAO report, which stated that, “CBP’s use of UAS [unmanned aircraft systems] is not limited to border and coastal areas of the United States.” The ACLU also pointed out that CBP has loaned out its drones for police work in the interior of the country. As CBP noted in its own advisory panel in March of 2016, “a law enforcement organization in a democratic society can tie its effectiveness directly to its level of public trust.” For CBP, that trust largely doesn’t exist. As long as its agents abuse their authority and officials give vague answers or no answers to the press, we need to find another way to shine light on CBP operations. The Nation is now making an open call for CBP whistle-blowers and leakers. We recognize that becoming a whistle-blower is a serious matter, with enormous consequences for the individuals involved—any person wishing to come forward with information of wrongdoing should seriously consider the potential personal ramifications. But we also believe that the public is safer when the country is aware of how the government is operating, and that we are more secure when the people act as a check on government overreach, abuse, and secrecy. When public interest and government policy drastically diverge from each other, when government officials engage in unconscionable acts, and when the system in place is not guiding policy or officials back toward legal or ethical governance, it is the duty of the individual—the person of conscience—to speak out. Anyone wishing to contact The Nation securely can follow this link to our confidential tips page. You can also contact the author directly at johnbwashington@gmail.com, PGP Fingerprint: BF59 799D B60B CBC8 088F D6B6 B3B4 A75E 7CA8 8622, PGP Public Key. To set up your own PGP key, follow this link. We look forward to hearing from you. Read Next: An interview with CBP whistle-blower James Tomsheck.